Located in Collin County, TX, Plano Independent School District is known for its high academic standards, award-winning architecture and state-of-the-art technology. Plano ISD serves approximately 55,000 students and employs approximately 6,800 employees spread across 72 schools, special programs and administrative sites. Each year, the school district generates millions of documents. In fact, the PASAR after-school care program alone generated 22,000 pages annually. PASAR is Plano ISD’s after-school care program for students in grades K-5. It provides a safe and positive environment where students can work on homework and participate in structured recreational and fine arts activities to enhance overall skill development. PASAR sign-out sheets are occasionally used for records requests and billing questions, as they provide the only accurate record of student sign-outs. Under the paper-based system, records specialists would retrieve documents from storage and redact the names of other students on the form before forwarding records. Now, employees can search for the required form in the Laserfiche repository using the student’s name and email the results within minutes. 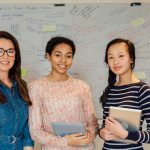 Here is how Plano ISD used Laserfiche to make the after-school program sign-out process paperless. The district requires that each of the over 3,000 students participating in the program be individually signed out by a parent or guardian upon pick-up. Previously, the school district used paper sign-out forms, which resulted in thousands of pages being printed, scanned, stored, and eventually shredded. Additionally, the paper forms lead to inaccurate billing and a difficult retrieval process. Now, approximately 3,200 PASAR forms are processed daily through Laserfiche Forms. 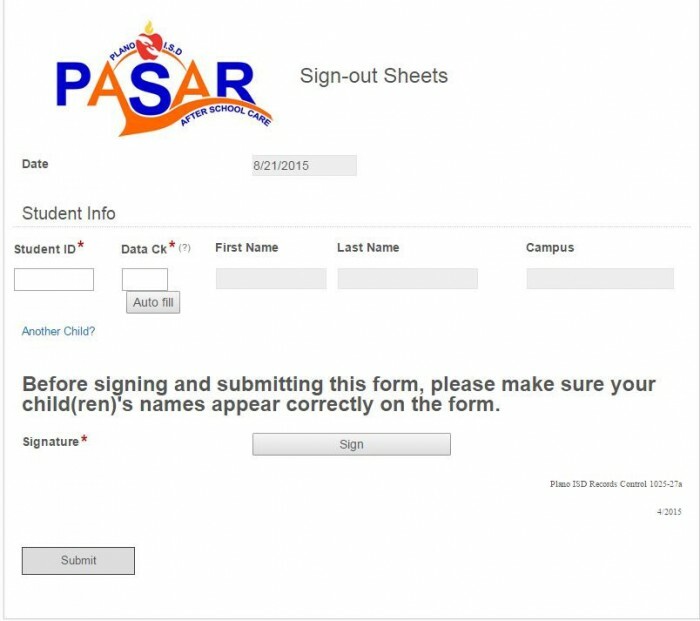 When parents or guardians come to pick up their children at the end of the day, they use an iPad to fill out a PASAR form pre-loaded from Laserfiche Forms. Laserfiche Forms automatically fills in the current date and time and locks the field so that it cannot be altered, ensuring an accurate sign-out record. Parents enter the child’s student ID number and first three letters of their child’s last name and select the auto-fill option. Laserfiche Forms performs a look up into the district ERP system, (TEAMS) to populate the student’s full name and campus. If the look up fails, the parent is able to manually fill in the name of the child. The parent can repeat the process to add their other children to the same form. Before submitting the form, the parent must sign it electronically. After submission, Laserfiche Forms automatically stores the form in an Incoming folder in the Laserfiche repository and names it using the date and time submitted. Laserfiche Workflow renames the form to correspond with the unique entry ID. 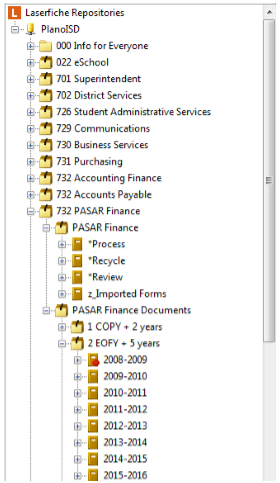 All of the PASAR forms are organized according to campus and are stored in the Laserfiche Repository. Laserfiche Workflow places a protected textbox on each document with the time of the form submission. This time is also added to the document’s metadata. 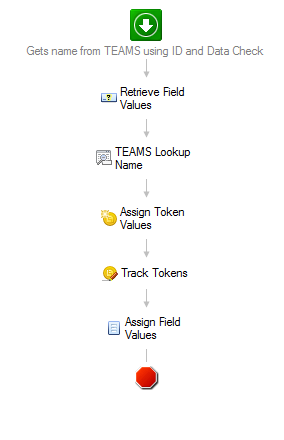 Additionally, Workflow automatically determines the current school year and also adds it to document’s metadata. Laserfiche Workflow performs a look up to the ERP system (TEAMS) to obtain the program and care type and adds them to the form’s metadata. If the name and student ID combination fails, the document remains in the Incoming folder in the repository where the Student ID is reviewed and corrected by the PASAR Specialists. Then, Laserfiche Workflow automatically performs a lookup to add the child’s name to the form’s metadata and files the documents. In accordance with state regulations, PASAR forms are kept for five years before being destroyed. With Laserfiche, employees can easily create an annual report by searching the repository for records that have met their retention. In order to determine if the district needs to collect late or drop-in fees, a PASAR Specialist performs a manual search for any entry that was submitted after 6:30PM or that has its care type marked as drop-in. Parents are then charged accordingly. Electronic forms are more accurate as they cannot be altered. Electronic forms are more legible, as they remove the issue of illegible handwriting. Plano ISD has saved money due to a decrease in printing, scanning, storing and shredding costs. Laserfiche’s search functionality has facilitated easy record retrieval, saving records specialists hours of time. With improved accuracy, Plano ISD has increased revenue collection of drop-in and late fees.